Using Digioh with Iterable allows you to automate your lead gen and email capture process with your activation and lifecycle marketing strategies. Capture emails in Digioh on your website and have them automatically pushed into Iterable where they can be added to lists or automatically trigger Iterable workflows. This integration requires an Iterable account and a Digioh account. If you’re not already an Iterable client, request a demo to discuss how the Iterable and Digioh integration can work for you. Start by logging to your Digioh account. Give the integration a name, select Iterable from the drop-down menu, and then click the Create Integrationbutton. On the next page, enter your Iterable API key, and click Save. You can find your Iterable API key by logging into your Iterable account and navigating to Integrations > API Keys. 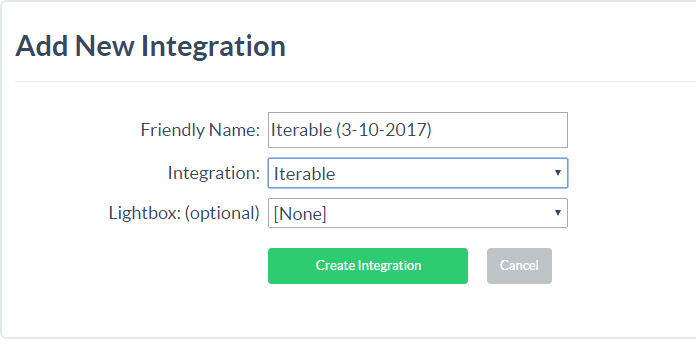 Go back to the Integrations page, find the Iterable integration you just created, and click the Choose a List link. On the next page, click the Select link to the right of the list you want to use. Repeat steps 1 through 7 for each Iterable list you want to use with Digioh. New leads submitted to Iterable via a Digioh lightbox will show up in the list associated with the integration you connected to the lightbox in question. To see your new leads within Iterable, head to Users > Lists and then select the list your leads are being sent to. On the next page, scroll to the bottom section to see a list of your leads, or use the filters in the top section of the page to find the lead. The Digioh integration only supports passing name and email, but we can add other custom form fields or any of the analytics data. Below is a list of all the analytics data that Digioh can pass.